Google usually likes to keep us on our toes, so it’s very rare for the search giant to announce a major change to its search engine algorithm in advance. Last month Google announced that from 21st April 2015 it will roll out an update to the search engine that will give mobile-friendly websites priority over other sites. For some time Google has been encouraging website owners to ensure that their sites operate across all platforms. Site speed has been a ranking factor since 2010 and recently they started highlighting slow sites. In November last year Google started to display “Mobile Friendly” against pages in mobile search that render quickly and correctly on smartphones. From April, Google will start to promote sites that provide a better user experience on mobile. Will this affect all searches? Google has said that the mobile search engine is being upgraded and that this change should not affect searches made on desktop or tablets. Although the April 2015 update may result in a major shake-up in search results, Google has stated that it is just a continuation of the work it has been doing to improve the user experience for mobile searchers. Google said that the purpose of this update is so “users will find it easier to get relevant, high quality search results that are optimized for their devices.” Therefore, it is expected that the changes next month will only affect rankings for searches on mobile phones. Mobile usage has increased dramatically in recent years and mobile users account for around 50% of all website visitors; failure to create a mobile friendly website could result in a dramatic loss of search referrals. 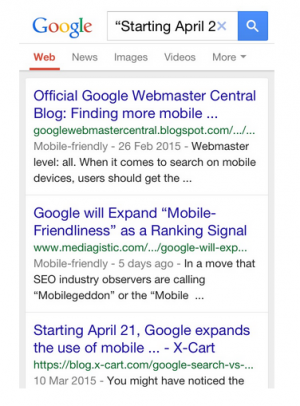 Google has provided a tool to test mobile friendliness: Mobile-Friendly Test. To determine if a web page is mobile friendly, simply enter the URL into the tool and hit the Analyze button. Websites with small text that cannot easily be enlarged is the biggest problem. Poor navigation, with links that are too close together, will also start to affect rankings. Google’s mobile friendly testing tool also provides advice on how to improve a site. Websites that operate on popular CMS platforms may need to have a new web template designed. WordPress and Drupal users have access to many responsive themes that will render quickly and accurately on mobile. For the time being at least, this update will affect specific web pages rather than incur a site-wide penalty, when poorly performing pages are encountered. With this in mind, a website that has some pages that use Flash or archive pages built in non-mobile friendly static HTML may find that these pages experience a fall in search referrals, while the homepage and main service pages continue to rank well. The indication that Google will start to operate a separate search engine for mobile friendly websites may mean that SEO strategists need to start focussing on building relationships with more mobile-friendly websites. 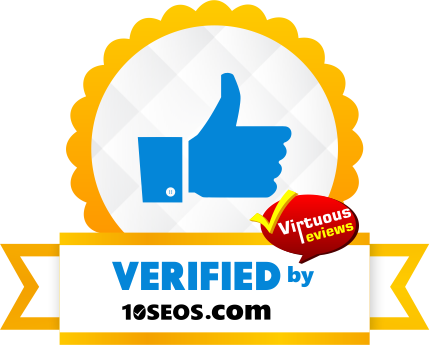 When the update is live we will be analysing its effect on our web properties and updating our SEO strategies in accordance with the changes. In the meantime, if you are concerned that your website is not mobile friendly, get in touch with Freelance SEO Essex today for advice!